Before discussing how to develop a health-contingent wellness program, a little background is needed. Why do workplace wellness programs even exist? The primary reason that workplace wellness program exist is to improve employee health and reduce employee-related expenses, especially healthcare costs. 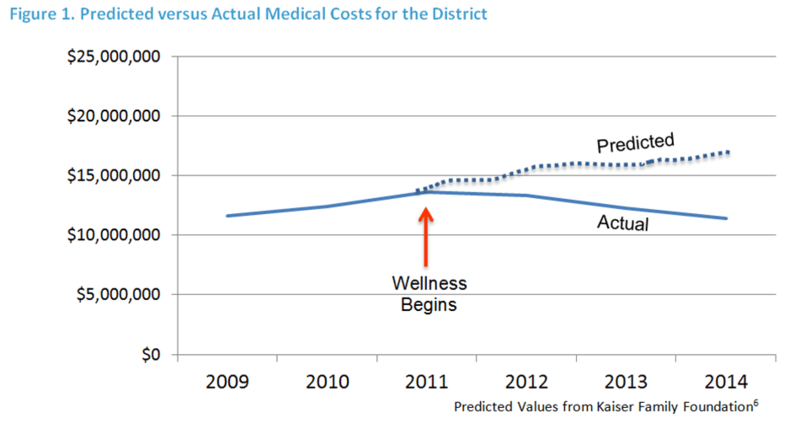 Everyone knows that healthcare costs are going up and they are projected to go up even higher. There are many factors driving these costs but one of the most powerful is poor employee health. A good wellness program will help improve employee health, which will ultimately impact healthcare costs as well as productivity, absenteeism, morale, etc. All of these costs have real financial implications on organizational performance. The main driver of employee-related healthcare costs is chronic disease, such as diabetes or stroke, and the risk factors that cause them. For example, the number of adults with diabetes has increased four-fold over the last 30 years. And about 1 in 3 US adults are pre-diabetic. 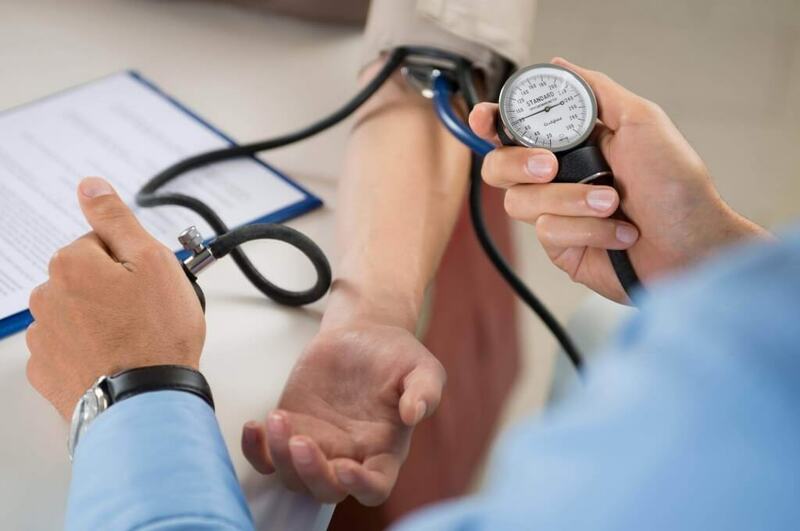 We know that risk factors such as high blood glucose, triglycerides, and blood pressure show up early for those who are eventually diagnosed with diabetes. So what is behind the increase in these dangerous risk factors? It should be no surprise that unhealthy lifestyle behaviors such as poor dietary habits, inactivity, and tobacco use are at the root of this entire problem. Surely even if workers universally adopt and maintain healthy behaviors, health care costs will still go up, but not nearly as fast or as steeply. So How Does a Health-Contingent Wellness Program Play Into All This? Health-contingent wellness programs are a fancy way of saying a wellness incentive program based on health risks. A health-contingent wellness program is one in which employees must A) meet a health standard or B) meet an alternate standard in order to earn an incentive or avoid a penalty. In most cases, a health factor is just a biometric value or smoking status. 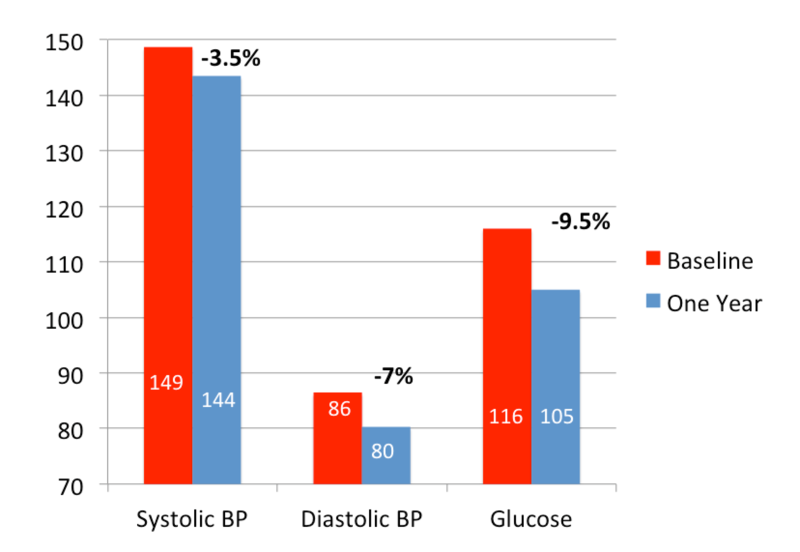 A health-contingent wellness program, or “outcomes-based” program, uses biometric values such as blood glucose or blood pressure as the health standard. The problem is that too many companies announce the program standards but don’t actually do anything to help employees change the underlying behaviors and learn the skills necessary to meet the standards. Just because a company has a health-contingent wellness program does not mean they have a program that does any good! Remember that the program must be “reasonably designed to promote health or prevent disease.” So how do you do that? An effective health-contingent wellness program does two things really well. First, it extends the program “reach” to as many employees as possible. And second, it provides an intervention that is robust enough to make an impact on health among the employees it reaches. 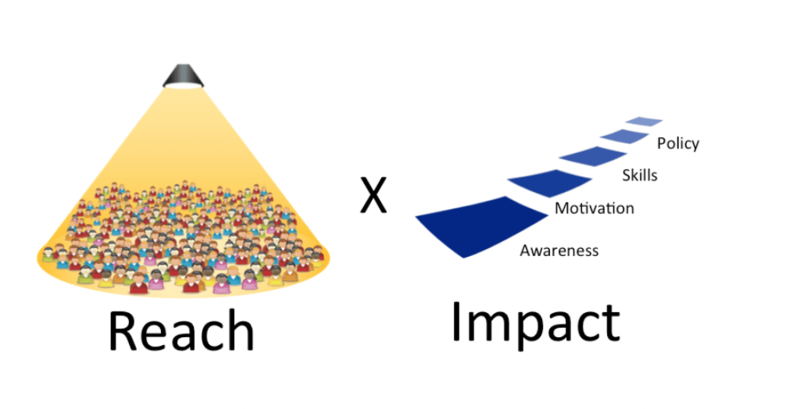 Overall program effectiveness is a product of both reach and impact. What Is The Most Common Mistake In A Health-Contingent Wellness Program? Focusing on just the employees who fail to meet the health-contingent wellness program standard (i.e., the high risk group) might seem like a good idea. After all, these employees are nearly always the high cost. However, there is a problem with this logic. Employees tend to migrate across risk categories over time. Research shows that every year about 60% of the employees in the high risk group will be new. Employees with elevated health risks can move out of the high risk group by lowering their health risks OR by quitting their job OR by passing away (heaven forbid!). The point is, if the wellness programming focus is always on this year’s high risk employees, the programming will miss those employees whose unhealthy behaviors or risks will cause them to be in the high risk group next year (or the year after). Wellness programs focused on the high risk only are chasing a moving target. A more effective approach is to focus on all employees across the entire risk spectrum. This will help to keep the healthy employees in the healthy category while also helping those with risks to improve. What Results Can an Effective Health-Contingent Wellness Program Achieve? One WellSteps client is a large school district in the Western United States. 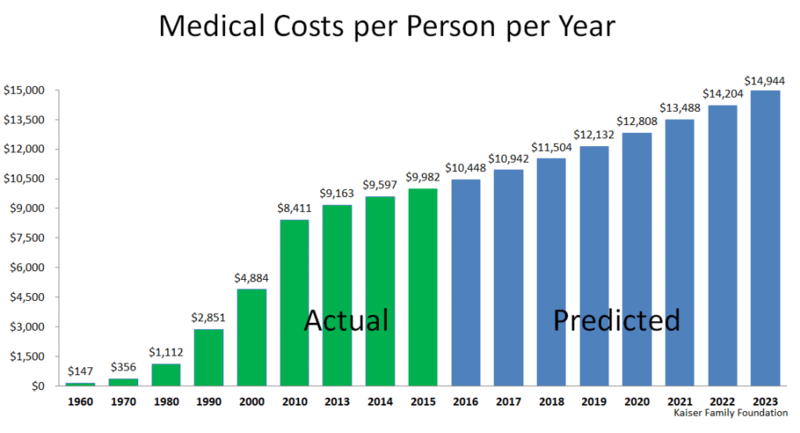 The chart below shows projected healthcare cost trends for this customer as compared to data from the Kaiser Family Foundation for other similarly sized organizations in their region. You can see that these two cost trends were nearly exactly the same until 2011. At this point, the client started with the WellSteps wellness program and you can see that their healthcare trend bent noticeably downward. In fact, their employee medical costs in 2009 and 2014 were nearly identical. Over a six year period healthcare costs remained the same. This group saw an ROI of $3.60 for every dollar invested and saved over 5 million dollars. Despite the focus on everyone, regardless of risk levels, you can also see that their high risk group substantially decreased their risk factors as well. The reach of this program was extraordinary and their program was incredibly effective. Here is the white paper that describes this evaluation. How did they do it? The evidence shows that when wellness programming is haphazardly “thrown against the wall to see what sticks,” about 1 in 5 employees will participate. 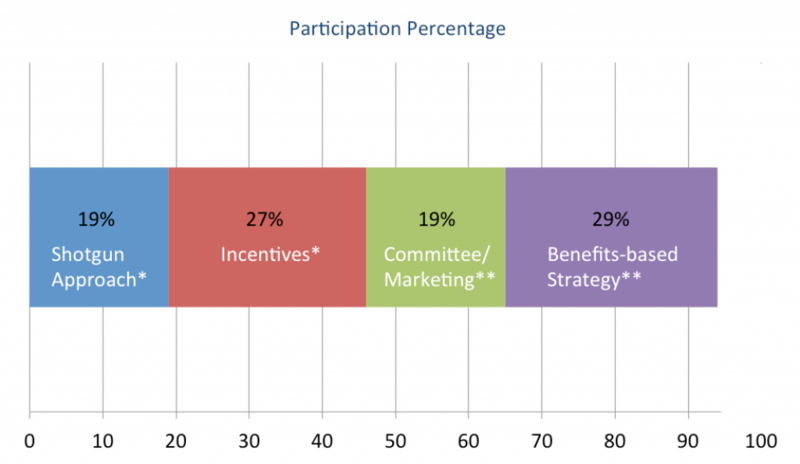 When incentives are added to the mix, participation will increase to nearly 50%. What this client did to significantly increase engagement beyond that was to add a very active and representative wellness committee. Committee membership was rotated among the vocal supporters and active participants on an annual basis. The combined efforts and strategies of the committee added another 19% or so to their participation totals. Finally, they tied participation to benefits using a very friendly health-contingent incentive, which added another 29% participation for a total reach of 94%. This health-contingent wellness program offered the employees a reduced copay, deductible and insurance premium when they completed the personal health assessment, biometric screening, and at least one WellSteps campaign. The employees love their wellness program. There are numerous personal success stories and 9 in 10 employees reported changing at least one behavior. There is still work to do but we attribute the effectiveness of this wellness program to the involvement of the wellness committee, the health-contingent incentive plan, and to overwhelming leadership support. What Are Five Key Steps To Developing An Effective Health-Contingent Wellness Program? Create a communication plan. The leadership team needs to be unified. Employees need to hear a strong “we want to help you” message with a promise of more information and an introduction of the coordinator. This empowers the coordinator. The committee can decide what requirements to include. WellSteps has developed a system that allows the committee and coordinator maximum flexibility to choose a disease or risk factors to manage. Finally, the plan involves communicating the benefits-based incentive, and including the chance to win smaller rewards throughout the program year while employees work towards a larger reward. Align with disease management. A benefits-based program is not enough if employees don’t have the tools and skills to help them adopt and maintain healthy behaviors. A disease management program and a health-contingent program are very similar in terms of preventing and reversing health conditions. 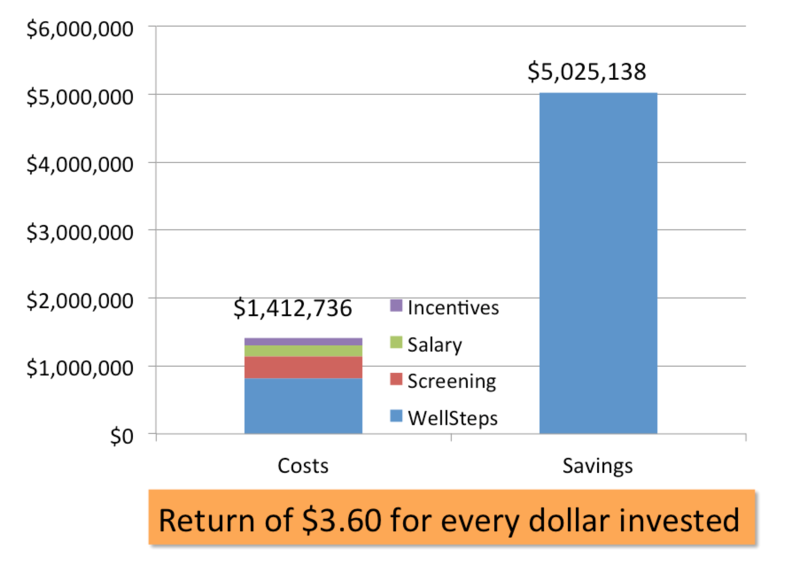 WellSteps has aligned our version of a health-contingent program with a disease management program by doing the following: A) identifying employees with diagnosed chronic disease, B) having an appropriate health screening at the workplace, and C) identifying those at risk and combining them for programming with those who have diagnosed disease. Tailor the plan to the company culture. A health-contingent program is never one size fits all. Variation based on region and business type must be allowed. WellSteps works with the assets that companies have in place along with WellSteps tools. For example, a hospital system with a health coach can be supported by WellSteps challenges and content-specific webinars. We also integrate biometric data with our Personal Health Assessment (PHA), which allows the committee to further tailor the program. Deliver, communicate and track intervention. WellSteps has made it easy for employees to track their status in the program. Using a tool called Wellness Plan, employees can see what they have done and they can get company-specific instructions on where to go, what to do, how to schedule, etc. We make it easy for coordinators to verify which employees have met the requirements of the health-contingent program. This creates a simple path for employees to meet the alternate standard and “graduate” every year. Evaluate and report. WellSteps provides a variety of reports, including aggregate data from our PHA, testimonials from and participation in behavior change campaigns, participation in our Rewards program and real-time movement of employees out of the at-risk into the healthy group. The last part of this process is to discuss research and evaluation opportunities with customers annually so we can document change in a peer-reviewed forum. When creating a health-contingent wellness program, it is essential to do more than simply create a program that follows the rules. A health-contingent program must reach everyone and create a meaningful impact on their health. A well-planned, strategic approach will help workplace wellness programs reach the most employees possible. This approach includes using media materials, incentives, a wellness committee and benefits-based incentives. Finally, to have the most impact a health-contingent employee wellness program should be tailored to meet the needs of individuals and should include an effective communication plan.